The tires, or what remained of them, on a mis-matched set of rims clearly had to go. 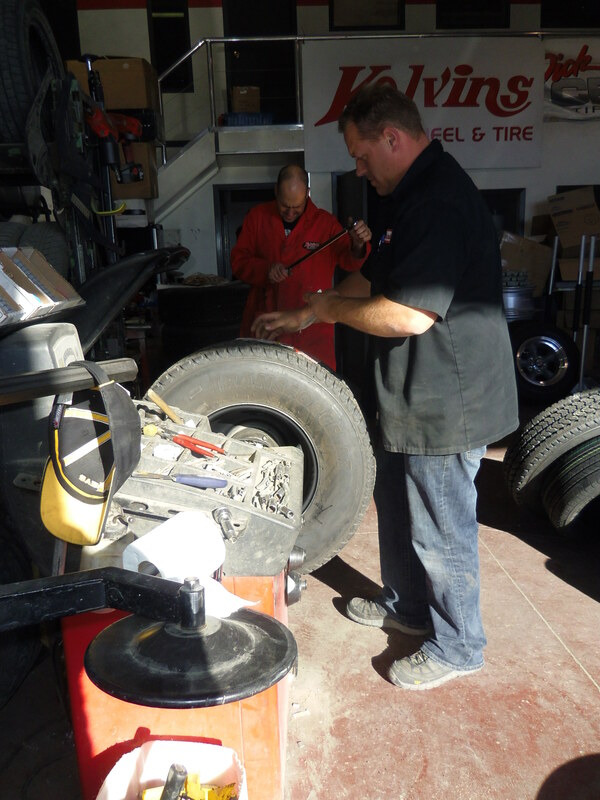 Thanks to Chad, and the guys at Kelvins Wheel & Tire , they fixed me up with a set of Firestone tires up to the task. The rims, we decided to swap out the remaining aluminium wheels, and make it a complete set of steel rims. The steel wheels that were there were all bent to varying degrees. 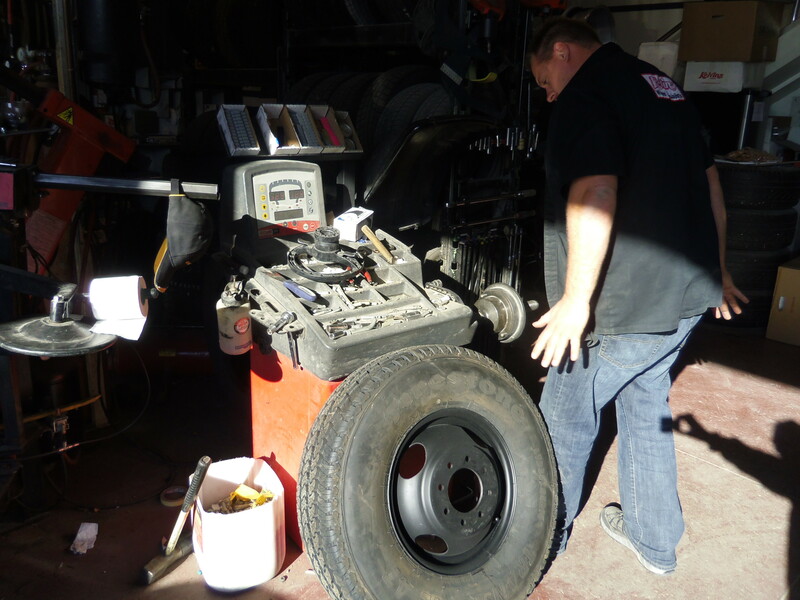 But, Kelvins Wheel got them all straightened and true in no time. While going through each wheel well, I decided to clean and tidy things up a bit, not that things were bad, but I was there anyway, so a little effort now will serve well. I used a healthy does of phosphoric acid on everything I could get at to get rid of any trace of rust, seen and unseen. I used Eastwood chassis black to shoot on everything I could get at with an HVLP touch up gun which handled well in the confined space of the wheel well. I allowed overnight drying, then laid in undercoat, another Eastwood product. As the factory rim colour is grey, and I didn’t have much on hand, and didn’t feel like grabbing a $75 can of automotive quality paint, a quick work around was created. I had a couple rattle cans of primer grey which provided a colour coat, then a clear coat using Eastwoods diamond clear to provide some toughness, and a little shine. Worked like a charm. Kelvins also came up with a set of Pacific Stainless wheel covers so that the beast didn’t look ‘too’ hill billy. Nice shiny shoes never hurts right? A little care, and a few tricks (Phosphoric Acid) along with some paint and a little undercoat, and I’ve added several years life back to the beast.. Some essentials for working in the driveway in the dirt and rust on a warm summer day..
Chad balancing out a replacement steel rim after mounting new Firestone. Rusty, the ‘Shop Foreman’ showed up to monitor progress. Before you guys give me a tough time about the cat, this guy is GREAT. I think he thinks he’s a dog as he behaves more like my dogs, than the other cats. Comes when called, and follows me around. Rusty gives his stamp of approval. Finished product, just in time for the Pacific Stainless covers. All dressed up. Threw the center cap on just for a look. But, I’ll have to do something to allow access to the locking hubs when I get a chance.